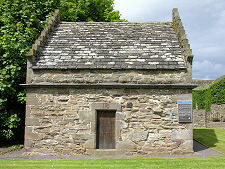 Tealing Doocot stands near Tealing House and its home farm and close to the Tealing Souterrain. Access is signposted in the village of Tealing, which you reach from the A90 just under four miles north of Dundee. Parking is available near the doocot. 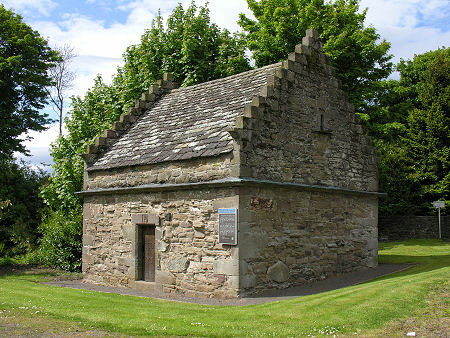 Tealing Doocot was built in 1595 by Sir David Maxwell as part of the farm intended to serve the needs of the residents of Tealing House. 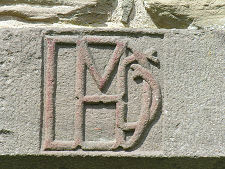 A gable stone carries a carving of the Maxwell arms and the initials of David Maxwell, plus the date, while above the door of the doocot is a monogram formed by his initials and an "H" for his wife, Helen. You are left in no doubt at all that though this was no more than a simple agricultural building, the estate was sufficiently prestigious to ensure that no expense would be spared in building a doocot of the highest possible quality. 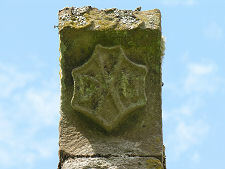 Doocots, or dovecots, were once quite common across large parts of Scotland, and were often shaped as circular beehives or as square buildings with a monopitch roof, the so-called "lectern" style. Tealing is therefore relatively unusual in its basic shape. 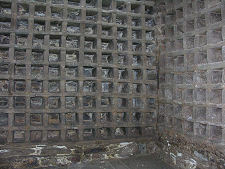 The purpose of a doocot was to provide the estate with fresh meat and eggs, especially over the winter when other meat was often hard to come by. 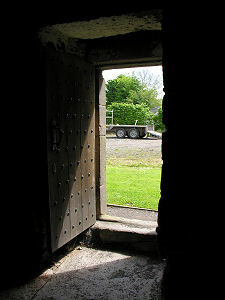 They also provided large quantities of droppings for use either as manure or in the making of lime mortar. The birds farmed in Scotland's doocots were usually a type of rock-dove. These gave a white meat similar to chicken rather than the darker meat of wood pigeon. The birds could come and go freely, feeding off the surrounding landscape, something that often caused conflict with neighbouring estates when it was their freshly-sown seed being eaten. 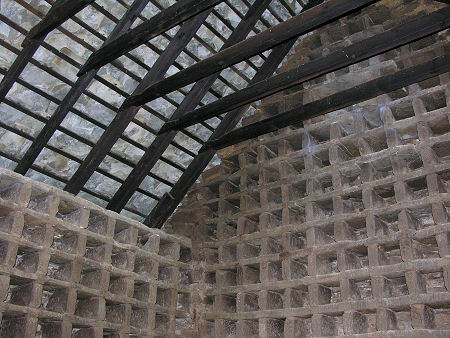 The birds lived in nesting boxes which lined the inside walls of the doocot. 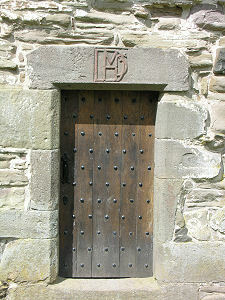 These were usually made, as at Tealing, of flagstones which formed the ledges and the dividers. Eggs and droppings could be collected at any time, but the birds themselves were harvested in the dark as they would not fly if they could not see. The servant responsible for what must have been a pretty messy task would find his way around by touch, using a ladder to reach the higher nesting boxes. Birds destined for the dinner table, either fully grown or as newly-hatched squabs, would have their necks wrung by hand. Doocots increasingly fell out of use during the 1700s, partly because of the problems created for the wider community by their residents, and partly because the introduction of meat markets meant that alternative sources of protein became more readily available.